Close your eyes. Inhale. Exhale. 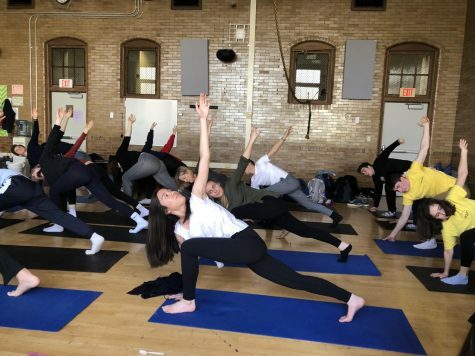 On March 22 during lunch, a handful of Community students rolled out yoga mats in the dance body room and joined Robbie Stapleton’s twin sister, Shelley Cichy, in a relaxing yoga break put together by Community’s Depression Awareness Group (DAG). Cichy is on the left, Diane Dudely is in the middle, and Stapleton is on the right. Cichy has been doing yoga for about 20 years and teaching it for 16 years. Around the time she started doing yoga she was involved in many other physical activities: running, swimming, cycling and more. Breathing and flexibility was something she wanted to work on, so she figured yoga would be perfect. But soon after, her reasons to do yoga have changed. “I realized it’s about a lot more than just flexibility and strength,” Cichy said. When it comes to mental wellness, yoga and exercise can help decrease stress hormones. The feeling of doing yoga can loosen your muscles and ease the built-up tension from being in a stressful environment. And the way Cichy puts it, it’s liberating. However, Cichy wasn’t the only one to have enjoyed this yoga break. Both Emily Lancaster and Nicole Tooley found the break was much needed. Taking in those deep breaths and stretching out her body, Lancaster found it to be a relaxing pause in her school day. Tooley, in the white, and Lancaster, in the green behind her, do the revolved side angle yoga pose. “School is so stressful, and it’s good to just take a break,” Lancaster said. Although Lancaster doesn’t do yoga on her own time, she has plans to start. Tooley, on the other hand, does it occasionally, and if she can’t make it to the yoga studio, she takes five minutes out of her day — sometimes more than once — for mindfulness breathing. “I think I liked hearing everybody just breathe, and having that silence,” Tooley said. 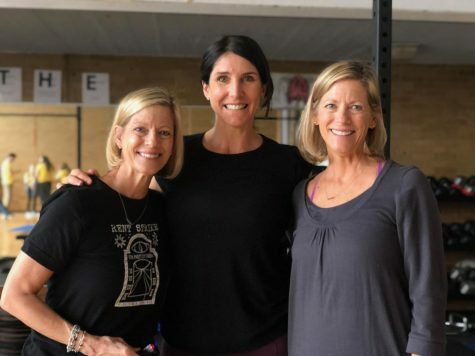 Just like how Tooley was able to recognize and appreciate her surroundings, Cichy finds the best word to describe the feeling she gets when she does yoga to be awareness. When doing yoga, try to be aware of your surroundings. Be truly aware of the silence — or noise — around you, even if it’s only for five minutes, by closing your eyes. Inhale. Exhale. Fortunately, this isn’t the last mental wellness break that DAG has put together. Look out for a special guest speakers event coming up the week of April 1!